We will meet in Safford at 10:30 am, about 135 miles from Tucson. With our guide, Don Lancaster, we will view a few of the more accessible of the 27 canals (over 40 miles in total length!). These unique prehistoric canals, which have recently be rediscovered, are spectacular engineered and a stunningly efficient water carrying system. 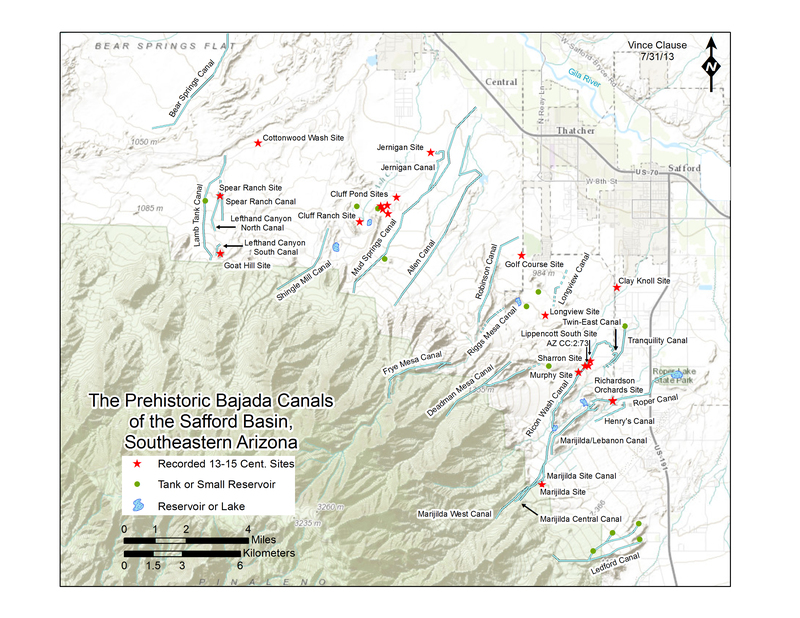 They differ from those in the Tucson and Phoenix basin in that the water is obtained from mountain drainages fed by runoff springs and artesian sources rather than from rivers. They traverse vertically undulating and severely erratic uplands. There is an option to stay over to Sunday when there will be a trip to some of the more difficult to access canals and possibly participation in research on the yet unexplored portion of the Mud Springs canal. More information can be found at www.tinaja.com/canal/cansum1.pdf and www.tinaja.com/tinsamp1.shtml. For this portion of the trip high clearance vehicles are recommended but walking distances are minimal (less than a mile). It is also a bit cooler in Safford! And, of course, appropriate desert clothing, shoes and water! After lunch at Juanita’s in Pima we will visit the Discovery Center where a portion of the Mills Collection of prehistoric pottery is housed. We should be on the road back to Tucson around 3:00 pm.